Joe Wicks, a.k.a. The Body Coach, shares a delicious and nutritious recipe from his first book, Lean in 15. Joe Wicks, a.k.a. The Body Coach, shares a delicious recipe from his first book, Lean in 15. The fresh crispness of the salad cuts through the richness of the meat. If you want to change it up, beef mince works well with this recipe too. Tip the lamb mince into a bowl. Add the cinnamon and cumin, spring onions, garlic and a generous pinch of salt and pepper, then mix the whole lot together thoroughly – I find the best way is to dig your hands in there. Mould the mince mixture into 4 equal-sized sausage shapes and place on your grill pan or a baking tray. Grill the koftas for 5 minutes on each side or until well browned and cooked through. Meanwhile, toss the cucumber, tomato, olives and vinegar together in a bowl. 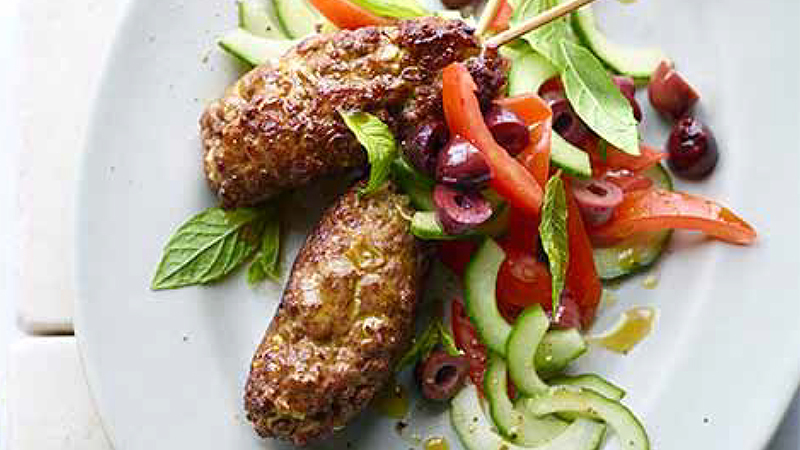 Serve your koftas with this chunky salad – and an artistic scattering of mint leaves, if you like. Recipe taken from Joe Wicks' Lean in 15 - The Shift Plan. Do you find it tricky to balance being healthy with cooking for a crowd? Joe Wicks' newest book, Cooking for Family and Friends, features more than 100 delicious and nutritious recipes that are perfect for sharing with the special people in your life. Out now in Hardback and Ebook formats.